A cooking utensil that is shaped like a bowl and is used as a container to hold and manually crush or grind ingredients, by applying pressure with a pestle to smash the substance on the base of the bowl. Mortars can be made from hard woods, stones such as lava, marble, or granite, and pottery. Ingredients such as grain, herbs, chilies, nuts, or herbs are often ground in this manner. 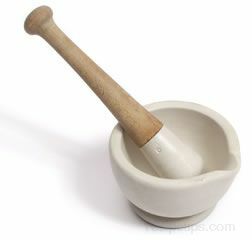 A pestle and mortar are often used to grind the ingredient so that the essence of the substance is released into the food being prepared.